The Museum of Lost Interactions is a hoax exhibition of fictional objects that try to challenge our preconceptions of interaction design history. Our exhibit revolved around a Victorian scientist, John Henry Jiffington, who needed a more precise way of measuring time in his experiments. Previous attempts to measure time intervals in his procedures proved inaccurate and laborious. In 1871, Jiffington took it upon himself to design a more precise apparatus for measuring and logging his experiments. 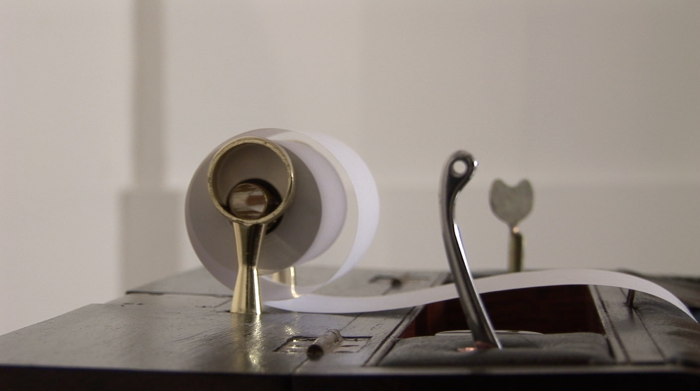 Jiffington enlisted the help of a local watchmaker to help him build his invention that timed and displayed sequences of actions to an accuracy of one quarter of a second by punching holes onto a reel of paper. After becoming notorious in the scientific world, Jiffington’s unit of time soon became known as the ‘Jiffy’ still used in modern English idioms today.